Jeff’s latest book, Blogs, Wikis, and Podcasts, Oh, My! : Electronic Media in the Classroom, has been well received by the education community and is in its second printing. His newest book will be released in March and continues his work on STEM education and 21st Century Skills. He has received many accolades, including the latest from Governor Linda Lingle for Innovation in the economy for his STEM education work nationally. 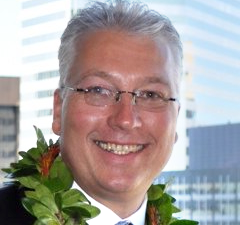 Jeff sits on the National Governor’s Association STEM committee as well as the State of Hawaii Economic Development Workforce Committee, which he was appointed to by the Governor. Jeff was appointed to the introductory Technology Advisory Board at the National Science Teacher’s Association and is an active member of many other national and international non-profit organizations. Jeff has embarked recently on a new venture at Educational Consulting Services, LLC. His current work has focused around STEM or STEAM integrating the ARTS into STEM, Policy work with the National Council of State Legislators, the National Science Teachers Association and private and public schools across the country leading them into the 21st century and Blended/Hybrid Learning.